Okay, now that that’s over with, I will try to keep my comments justifying myself to a minimum. 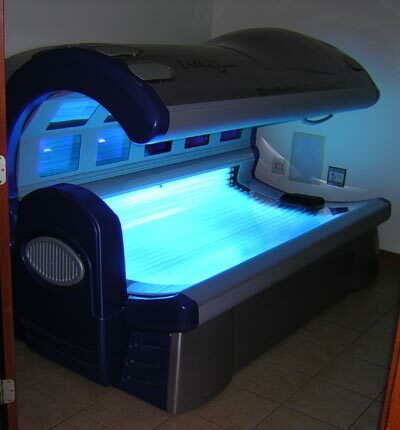 Confession: I have never been to a tanning bed. Ever. And I didn’t think I would ever even see one live, up close, and in person…until I was trotting out the door to have my bridals taken and heard my brother Carter say, “Nice tan line, Torts.” I laughed it off and mostly brushed the comment aside, until we got our pictures back and I saw that every picture of my back had an impressive farmer’s tan line etched right above my dress. So what’s a girl to do? The line had taken me a year and a half of drowning in the El Salvador sun and heat to get, and I knew it would not go easily. I considered doing a sunless tanning lotion at home, but I was worried about the possibility of streaks, not to mention the fact that I can’t stand the smell. I considered doing a spray tan, but I had one too many people (or like ten too many people) tell me not to risk it, citing the fact that I didn’t want to look like a carrot on my wedding day. So I decided to do it–to go against all my sun-protection morals and just go for it. With Matt’s solid disapproval sitting like a dumbbell in my stomach, I drove over to The Rage salon. With my free tanning session coupon clenched in my nervous fist, I walked in the door with palm trees painted on it and saw three girls with distinct tanning-goggle lines sizing me up. The curly-haired brunette looked at me sympathetically as she handed me a clipboard so I could fill out my information. I tried not to listen too hard when they started talking with each other about how going to FHE was like extra credit…if you missed church, you could just make it to Monday night’s activity. Needless to say, I was probably trying too hard not to look too scared after that. But the worker shut me in the closet-like room, and I proceeded to gingerly strip down to my underwear and make my way awkwardly onto the rounded surface. Positioning myself and taking a deep breath (just in case it would be my last), I pulled the top over me and lay in my glass coffin, waiting to see the light. Even with my goggles on, I saw the lights burst on, beaming from one end of the bed to the other. I swear I saw green and pink rays shooting up the sides, and I thought, “Is this thing gonna EAT me? !” It was the closest experience I’ve ever had to being abducted by aliens, and I dreamed of soaring off in my UFO to a far-away galaxy where there were no tan lines and where everyone gets by on extra credit religious practices. Since I was paranoid that the parts that touched the machine would get more burnt, I lifted up my arms and legs, giving myself a killer ab workout while I slowly baked in the coffin-sized UFO. And before I knew it, the lights all went out and I felt a breeze of cold air chill my pink skin. Slowly rolling out of the bed, I peeked my face into the mirror, expecting to be horrified by swelling blisters and even worse tan lines. But I saw nothing…just my own, bemused expression looking back at me. The brunette assured me that it would show up more as time went on. But as of now, two days later, I have maybe changed one shade and I still have my tan line. Oh well. It was cool chillin’ with the UFOs and aliens while it lasted. Next ArticleGreetings From Sunny St George!